It has been a long and challenging journey for our solar co-operative since our inception in late 2015. Over the last three years, we navigated through an energy landscape in Alberta, which was lacking the right policies and infrastructure in place to welcome community investment in renewables. But we chose to persevere and dive into policy development work instead, to help us get closer to our mission and goal of developing Alberta’s first community-owned solar farm. After countless engagement sessions with the government and Alberta Utilities Commission (AUC) as well as preparing a detailed submission to Alberta Energy in response to its call for engagement on Community Energy policy development, we feel like our “dream” is now finally attainable. The Government of Alberta just announced that they will be investing $200 million in Climate Leadership Plan funds over 20 years to launch a new Community Generation Program! Over the coming months, the province in partnership with Energy Efficiency Alberta and the Municipal Climate Change Action Centre will undertake capacity-building efforts to help communities prepare to participate in the program before it launches in fall 2019. This new Community Generation program will make it easier for communities to invest in renewable energy projects and our cooperative model is the perfect match for this, particularly given the new Community Economic Development Corporation (CEDC) Tax Credit for Albertans. Newly developed legislation (Investing in a Diversified Alberta Economy Act) will allow ASC and other cooperatives that are developing social impact initiatives to offer a 30% tax credit for investors. We are currently working on all of the necessary processes to ensure that our investors can take full advantage of this tax credit. Also, more exciting news for our co-op is that we were awarded a generous grant from Energy Efficiency Alberta through the Community Energy Capacity Building (CECB) Program to help develop our co-op, work on our investment model and further our mission. Stay tuned for more details on what we have been working on in our next blog post! The initiative will support the installation of locally generated electricity projects. It will also reduce greenhouse gas emissions, spur investment, diversify local economies and support local jobs. 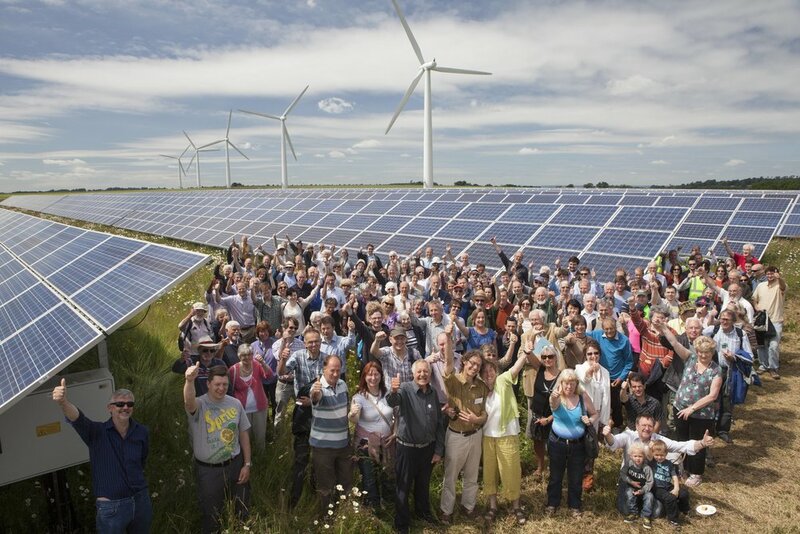 Community generation will enable neighbours, community groups, municipalities, agricultural societies, rural and urban co-ops, universities, schools, Indigenous communities and other groups to partner on small-scale renewable energy projects such a wind, biomass, hydro or solar that provide community benefits. The program will support a “contract for difference” model that guarantees a rate of return for electricity production over the long term – locking in a rate for generators. The $200-million fund will facilitate investment in community-scale renewable energy projects by guaranteeing the price they receive for the power they produce. Up to $50 million from the fund will be dedicated to supporting community generation projects in areas affected by the phase-out of coal-fired electricity. Thank you again for your crowdfunding support! We apologize for not being more proactive with providing regular updates on our progress and activities. After paying for the crowdfunding perks and Indiegogo transactions fees, ASC has used the net crowdfunding contributions to cover the costs of incorporating as a co-operative in Alberta, developing our articles and bylaws as well as the formal documentation required to offer investments to Albertans as co-op member-investors. The remainder amount is being used to cover the basic administrative costs associated with keeping the co-operative active in the community energy dialogue. We are trying our best to move this co-op along with our volunteer board and current energy / policy landscape that has made it challenging for us to launch the first community owned solar project. Over the last year we have continued to engage with the Alberta government as part of a coalition of community and distributed energy advocates such as EQUS, Momentum and many others. ASC has participated in community energy engagement prompted by the Alberta Utilities Commission (AUC) on how Alberta's electricity system can practically accommodate the addition of various forms and amounts of distributed energy. We have also provided Alberta Energy with a submission in response to its call for engagement on Community Energy policy development. To increase our networking efforts and to open doors to new partnerships and project opportunities, ASC has become a member of Decentralised Energy Canada, an association of over 60 organizations that supports a distributed system of electricity generation from renewable and alternative energy sources. At present, we are hearing that the government is developing community energy policy which would enable community solar projects to be financially viable. We currently do not have an exact project identified as we are waiting for the community energy policies to be finalized. In July, we received a grant that will be put towards building a business and marketing plan. Once the business and marketing plan is in place, you should see more updates posted to our blog and social media feed. We are doing the best we can with limited resources and have been sparingly using the funds received to date to keep the co-op active and moving forward. Earlier this month, Alberta Solar Cooperative (ASC) directors attended an Energy Futures Lab workshop in Calgary, which was hosted at TELUS Spark. The attendees of this event were people who identify as innovators and influencers in Alberta’s energy system. Gerardo Marquez, one of the founding members of ASC, is an Energy Futures Fellow. Gerardo is a champion for community energy and a connector in the Alberta’s energy space. An open space style of session allowed for multiple conversations to be had that addressed diverse topics on Alberta’s energy system — from energy for transportation through to training (and re-training) of workers in our energy sector and in a lower carbon economy. Seth Leon and Colin Rioux of ASC were invited to attend, contribute, and learn from those conversations. In answering the above question posed by Energy Futures Lab, ASC believes that accelerating our energy economy towards a lower carbon system can strengthen Alberta’s energy leadership position. We believe a new energy economy can only be achieved through collaboration. This is why EFL is exploring what that energy system of the future looks like for Alberta. EFL is currently made up of Fellows from diverse backgrounds who work in all areas of the energy industry; be it in think tanks, co-operatives, or large oil companies. Our co-op is also formed on the principles of co-operation and collaboration. We are excited to participate in workshops and discussions that help us understand how we can provide Albertans with opportunities to participate in the creation of Alberta’s future energy system. We are working hard to develop an investment platform where any Albertan can invest in RRSP and TFSA eligible renewable energy and efficiency opportunities as well as benefit from those returns. We welcome discussions with communities, municipalities, agencies, energy developers, and any innovator and influencer that wants to collaborate with us to bring these energy opportunities to Albertans. Let’s leverage our existing energy leadership and start positioning Alberta as an energy leader for the future. Alberta Solar Cooperative (ASC) directors and allies attended the 2016 Alberta Climate Summit titled “Mapping the pathway to Alberta’s low-carbon future”, which was organized by the Pembina Institute. Over 500 participants attended the event, including more than 30 panelists, a majority of which travelled from outside of Alberta. The summit’s opening address from Shannon Phillips, Minister of Environment & Parks, provided attendees with a status update on what the government has achieved to date on its Climate Leadership Plan. She also described what will be unfolding in the near term, including the formation of Energy Efficiency Alberta (the agency tasked with developing community-scale renewable energy programs). One recurring message of the summit was that fighting climate change is a shared responsibility. Government, businesses, and Albertans all have a role in this and are called be part of the solution in the transition to a lower carbon economy in Alberta. The importance of a collaborative approach was repeated over and over by panelists and those representing government, companies, and communities. The summit reaffirmed the relevance of our cooperative and a growing need for alternative funding approaches to renewable energy development in the province. The breakout sessions on utility-scale and community-owned renewables reinforced that direct economic participation in community-scale renewables is possible, and that Alberta communities are already exploring ways to fund renewables themselves. Our First Nations are looking to renewable energy as a tool for improving the economy and prosperity of their communities and are also exploring co-operative models of ownership. Panelists and presenters kept highlighting the need for innovation funds and the importance of clean-tech funding. Overall, the summit was a positive experience with a healthy balance of optimism and realism. We are hearing that more and more players in Alberta’s energy economy agree on the need for action. We feel that the government is listening to our feedback and addressing the need for policy that will help direct the energy and actions of all who want to participate in this challenging opportunity. We will make it possible for Albertans to directly participate in Alberta’s renewable energy transition, through RRSP and TFSA eligible member-investments. We were happy to reconnect with existing supporters and partners, and also make new connections. We hope to develop these relationships, using collaboration and co-operation in answering Alberta’s call to climate action. To learn more about the summit and view recordings of the presentations and panel discussions, visit the Pembina Institute’s Twitter feed here. Over the last few months, Alberta Solar Cooperative (ASC) has been working hard to develop the model for cooperatively owned solar projects in Alberta. In order for us to launch our first project, we need to ensure that the environment and landscape (electricity system and government policies) are favourable for large-scale community owned projects. Therefore, we have been closely monitoring the renewable energy landscape being painted by Alberta's government, electricity system operator, and the vast number of stakeholders that will inform Alberta’s renewable energy future and define its opportunity. ASC aims to help define community energy in Alberta — where Albertans own, participate and benefit in the development of Alberta’s renewable resources. We have been working in the background to build the capacity and relationships necessary to provide Albertans with such opportunities and benefits. Alberta’s Energy Efficiency and Community Energy panel, tasked with engaging with Albertans to promote, design and deliver programs that include development of small scale energy systems in Alberta. In addition to that, while the province has been working on implementing its climate leadership plan, ASC has been building its capacity and formalizing the co-op’s strategy. The government has recently formed Energy Efficiency Alberta (EEA) to design programs that will provide the most impact in reducing Alberta’s GHG while stimulating renewable energy and community economic development. While provincial-wide plans for a lower carbon future are developed and rolled out by our government, we will continue to develop our capacity and roll out plans that will be a driver of renewable energy through RRSP and TFSA eligible investments for its members. We have made inroads with evaluating the feasibility of developing a co-operatively owned solar farm in partnership with Starland County. Our formal submission to the Energy Efficiency and Community Energy panel later this month will outline the challenges we have been working to overcome as we truth tests the viability of community scale renewable energy. The ASC will continue to engage decision makers and strategic partners to position itself to be a solution for Alberta and Albertans. In cooperation, we are redefining Alberta’s energy leadership.